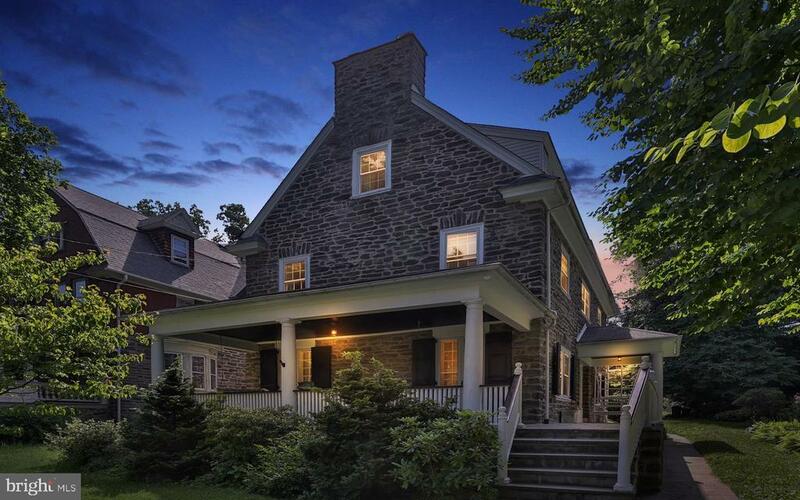 Stately Center Hall Stone Colonial, c.1911 in Historic Pelham bringing Old World Charm to Life In Philadelphia! This Turn-of-the-Century Colonial blends yesteryear elements & harmonizes them architecturally with modern day upgrades in all the right rooms: Kitchen and baths and mechanics! This home is complete with generous rooms, inviting wrap around open front porch with swing, handsomely sitting high above the street to offer direct sunlight in every room. Amenities include: 4 fireplaces, paneled rooms, oak and pumpkin pine refinished floors, pocket doors, 2 staircases, freshly painted interior bedrooms in muted colors. Enter into the Center Hall with large coat closet, Living Room with marble fireplace with glass French doors facing front. Formal Dining room with yet another marble fireplace, magnificent crown and wood moldings, wall of milled built-in cabinets, convenient rear beverage room with lighted cabinetry, wet bar/sink, and granite counters, back stair case to 2nd floor. Anyone who cooks will love the kitchen (2013). It offers the ultimate in gourmet convenience with its superb European style and feel, warm, open and sunny complete with milled white wood cabinets, glazed high white subway tiles, hand hewn hickory wood floors, food preparation area with 5-burner gas stove, all stainless appliances, garbage disposal, deep farm sink, granite and butcher block counters, designed breakfast room, 1st floor laundry all exiting to rear yard/garden. Upstairs you will find a Master Bedroom suite, wood burning fireplace, full master bath, French doors opening to a balcony overlooking back yard and gardens, and decorative moldings. This fabulous home boasts almost 4200 interior sq feet of living consisting of 6-7 bedrooms, 4 full baths, 1st floor powder room, two staircases, 1st and lower level laundry, clean dry basement, big back yard. Lower level basement with newly installed washer and dryer all waterproofed and meticulous, ready to be finished and outside exit. Extras include: plenty of closet space throughout, new flues in all fireplaces ( 2005 ), gas steam heat, 200 amp circuit breakers with most wiring replaced, asphalt shingle roof, new PEX plumbing and newer plumbing pipes throughout, recently painted interior in muted pretty colors, refinished oak and pine floors. A Romantic Home of Traditions that harks back to a gentler, more gracious era that blends yesterdays charm with todays conveniences. Green Remarks: some replacement windows, reverse osmosis storage tank for small kitchen sink, energy efficient appliances.